Lisa Soares Hale was raised in the Hawaiian Islands where love, family and cherished traditions are a part of everyday life. She spent many hours in her childhood listening to her family's stories of days past. The colorful Hawaii of her youth was a place where "family" extended beyond bloodlines and flowed to neighbors, friends and even strangers. After graduating from high school in Hawaii, Hale moved to California where she graduated from California State Northridge with a bachelor's of science degree. 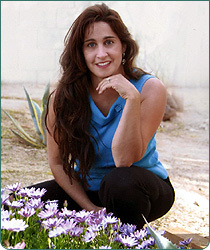 She now lives in Phoenix, Arizona with her husband and three daughters. Penny Love is her first book. The Penny Love tradition is very real in the lives of her three little girls. The author cherishes those moments when she sees her own daughters smile when they find pennies and are reminded of their grandmother's love. Lisa Soares Hale says, "The most tender moments are when I see my own mother picking up a penny and whispering towards heaven." Penny Love is a book that people, young and old, like to talk about. Lisa Soares Hale would love to hear your own personal stories and feedback. Will the author come to our event? Can our students buy copies of Penny Love? Absolutely. Lisa will be glad to take pre-orders so that she can personalize each book with an individual inscription and give them out personally. Lisa will also have books on hand at the event for anyone who would like to purchase a copy at the time. What will the children learn about? Any organization that would like to sell Penny Love should contact Lisa Hale directly for wholesale pricing.